Swing FileChooser, Swing component is an object having a graphical representation that can be displayed on the screen and that can interact with the user. Examples of components are the buttons, checkboxes, and scrollbars of a typical graphical user interface. Swing components are fundamental building pieces of an application. 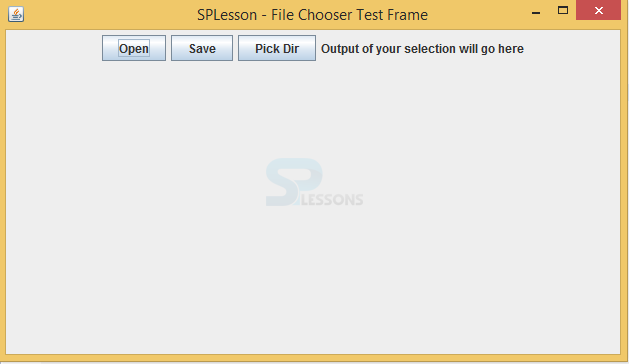 Swing FileChooser is a component which gives a functionality to select the data from the system. Following is an example which describes more about this concept. Following is an example for Swing FileChooser from the system. //A simple file chooser to see what it takes to make one of these work. statusbar.setText("You saved " + ((chooser.getSelectedFile()!=null)? statusbar.setText("You opened " + ((chooser.getSelectedFile()!=null)? Create a class that should extend JFrame. Set the logic at status bar. 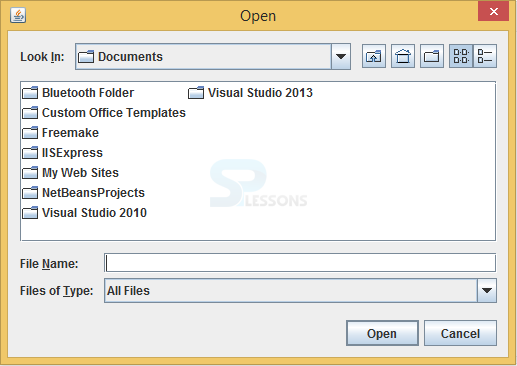 When click on open following output will be displayed. Swing FileChooser – setDefaultCloseOperation(EXIT_ON_CLOSE); to close the operation done user. To create the gap between the components developer will use setAutoCreateContainerGaps(true); . To add the more effectiveness to the application different buttons will be added to the applications.